We are bonded - this eclectic group of strangers. We huddle in cocoons of our own making. The quadriplegic in his wheelchair, senior citizen in her sporty black and gray plaid cap, housewife in jogging pants and tennis shoes, and the teen with the hog-sized ring hanging from the center of her nose. Together we bring the energy level of this room to a very heavy place. We each hold a furry soul in our hearts who struggles through a life or death procedure beyond the doors - in an area we can't reach. A flash of white comes from the inner sanctuary. In unison we look up, hoping it is "our" vet student with word that our pet is doing well. The lovely Asian woman smiles at the student, then turns away, flashing truth to her daughter - a sad and very worried expression. Another student comes forth, holding back a wiry haired little guy with a bright yellow bandage surrounding his belly. A middle-aged couple lights up, jumps from their seat and calls the dog's name. For a moment the pall is lifted. Someone's pet will be fine. From the outside comes a woman, 60's, anorexicly thin. Her face painstakingly designed by years of viewing the negative side of every situation. A furry Golden Retriever, face graying, peers after her, worried for her wellbeing. That one so decidedly sweet can worship at the heels of one so obviously crabby is proof that dogs are teachers - gifts from a higher source. Unlike most of us who can't bear to leave this place - she drops off her dog and leaves. A blonde. so fat she requires the aide of a walker, waits - two Yorkies resting on the ample chest which forms a cushioned couch for their support. Piled together as though they are one, they rest their tiny heads on her shoulder as she nestles her florid face in their rough coat. They worry for their other pack member as one. I wait, as I've waited for the past 6 hours when Arayo was taken from me. "My" student has just approached. "Are you ready for this," he asks? They are taking her in, surgery will begin in a few minutes. The surgery which will split her belly, remove organs, tacking some, adding support to others, is ready to begin. Many from around the globe join me as I worry for my girl. "My sweet Arayo. I hope you feel the prayers and thoughts of love which are streaming your way. Please hold strong, be safe. I love you." Karyn, you describe the waiting room so well! Here's to a good, successful surgery for Arayo, and a complete leak free recovery!! My thoughts and prayers are with you. I too know the pain of waiting and not knowing, the anxiety and the self doubt. That is what makes us the lovers of these furry creatures. She will be fine. My prayers are with you and Arayo. I'm a little teary as I think of you waiting for Arayo to be fixed and returned to you. My heart is with you and my thoughts are with Arayo. I can't wait to hear the news that she is out of surgery and doing just fine. 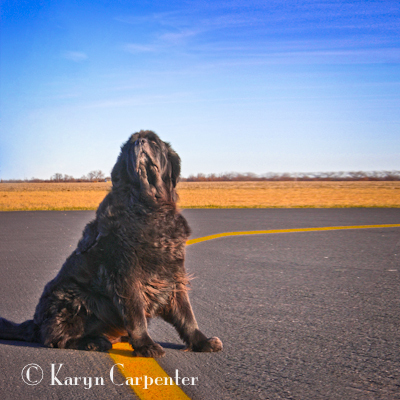 We don't know each other, but I'm a fan of your blog and owned by a newf, as well. I'm sending good vibes your and Arayo's way. She'll be home before you know it! Wishing the lovely girl so dear to your heart does well..this arrayo with her mystical and magic soul...all my love goes to you both..